During the winter season, when flavorful Nolen Gur becomes available in Bengal, sellers hawking Joynogorer Moa becomes common sight all over the state. 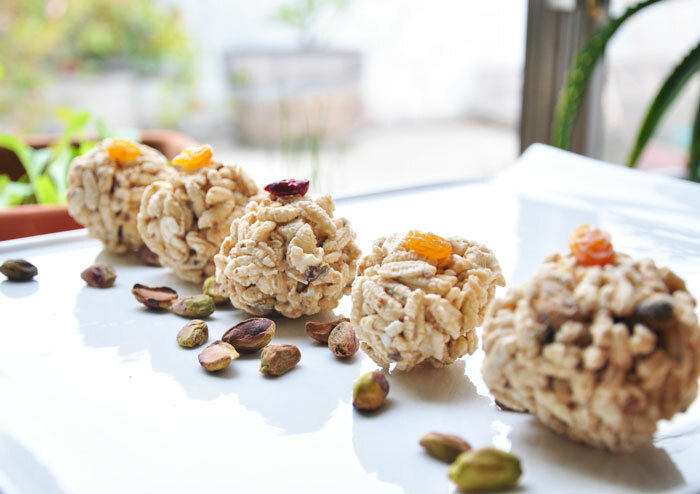 Moa, a crunchy puffed rice ball is a traditional sweet snack. 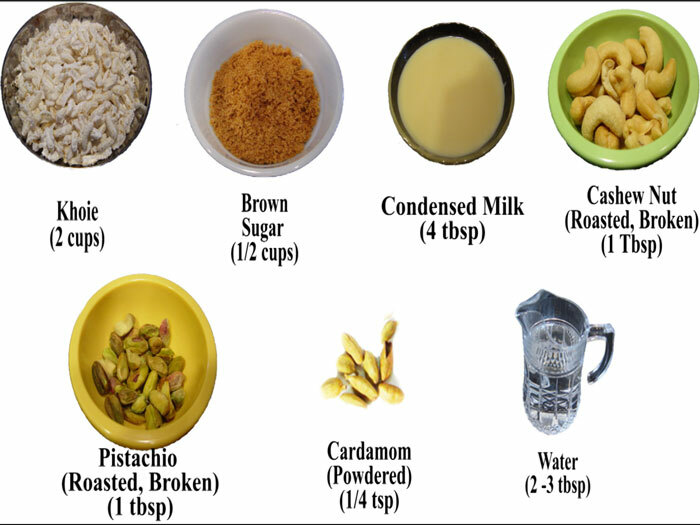 There are several kinds of Moa, some made from puffed rice (Moori or Murmura in Hindi) and some from puffed paddy, called Khhoie in Bengali.Traditional Moa made from puffed rice and date-palm jaggery is crunchy. Joynagar-er Moa, on the other hand, is made from Khhoie from the special Kanakchur paddy with the seasonal jaggery, the Nolen Gur, which comes from the date palm. Joynagar-er moa is soft and chewy. We decided to replicate this soft moa with ingredients that are available at local Indian grocery stores. Make 8-9 4-inches by 4- inches squares from non-stick aluminum foil. We used it for making individual moa. In a non-stick pan, add the brown sugar, condensed milk and water and stir to a consistent mixture. By the way, increasing the amount of water by a little amount will make a softer moa. Turn on a low flame and as it is heated, stir continuously to a free flowing thick mixture. At that point set the flame to the lowest level. Spread two non-stick aluminum squares side by aside. And scoop the khhoie onto the foils. Then use the aluminum foil to compact the khhoie into a ball. We also used a spoon to compact the khhoie on the foil. It may be convenient to keep a wet paper towel nearby to wipe your fingers in case your fingers get sticky. This way finish all the remaining khhoie to moa. Place the moas in the foil in a refrigerator for about 2 hours for them to set. Then after removing from the refrigerator carefully remove the aluminum foils and set the balls on a plate. The balls can be garnished with raisins. And this completes the preparation. It takes about 30 – 45 minutes to prepare Khoie-r moa.